When you need to find articles, the first place to look is in the library databases. Some databases are general and others cover specific subject areas. A good place to start searching for articles is the database Academic Search Complete, because it covers a wide range of subjects and contains many articles in full-text. Databases that cover specific subject areas are located under the "Find a database by subject area." For example, if you need articles about attention deficit disorder, select the Psychology category to view databases which contain articles on Psychology. PsycINFO is a good choice for articles on the psychological aspects of the disorder, MEDLINE for the medical aspects, and ERIC for the educational. 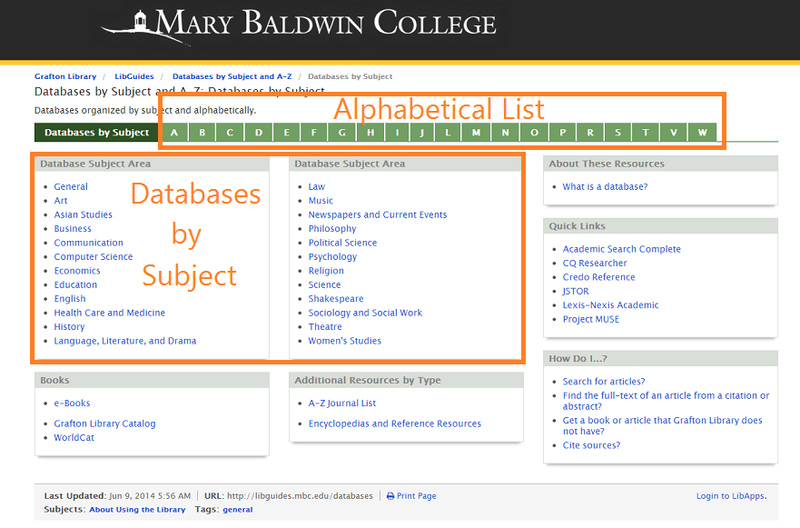 You can find a database by browsing for them in the subject area listing or the alphabetical listing. Top databases, like Academic Search Complete, are located in the drop-down menu, "Top Databases," on the library's homepage. The database you decide to search may look different than this one, but most databases contain a set of several search boxes. Split up your search terms so there is one one word in each box. Or, if there are two or more words that together as a phrase, like "global warming", surround them in quotation marks. By full-text, peer-reviewed, and date (left image), or by subject term (right image). This may narrow your research to articles more closely related to your research topic. Refining by subject term can also give you ideas for search terms. Find full-text. If your article has a PDF full-text link, then you are all set to go! Click on the link and your full-text will appear. If not, you'll have to find the full-text through other means. No PDF full-text link? That's okay, we'll try to find it in another database. Go to the "Find full-text article from a citation" for further instructions. A database is a collection of organized information. In its very simplest form, a database can be like a phone book, organized either alphabetically by name, or by subject in the yellow pages. These days, all of our library databases are searchable, digitized collections of information and useful for fast search and retrieval. In this section of the guide, we are going to be talking about databases that contain Journal or Newspaper articles. You'll notice on the Databases & Resources page on Grafton's website that Grafton Library subscribes to a lot of different databases. 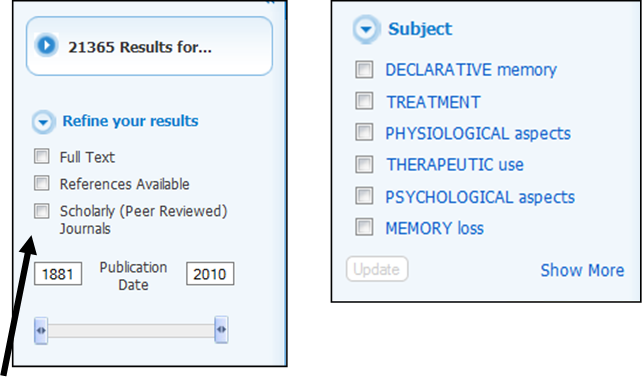 Many of our databases search specific subject areas. We subscribe to both general databases (which search through journals and magazines from many different disciplines) and subject-specific databases (which search journals on specific topics, such as Psychology or History).